Aside from the colorful, happy posts, I wanted to share these haunted and scary looking fashion pictures on my blog today. 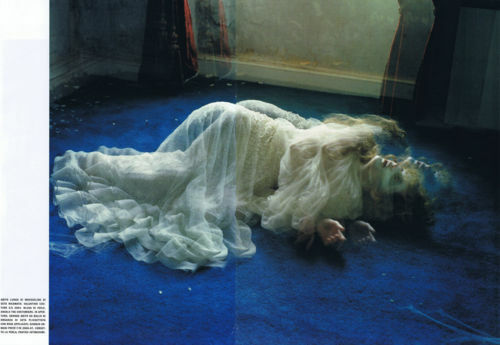 The pictures are from Vogue Italia March 2011 issue, the name of the photo shoot is 'Dreaming of Another World'. The name couldn't have been better, perfectly describes the pictures, the models don't look like they are from this world at all. These pictures make a new genre: Fashion Horror :). I kind of like the shoot because it is different, nothing I have ever seen before. Difference is good. Do you think this is way too scary for Vogue? or do you think exploring new genres helps fashion move forward? This is great! So adventurous, but maybe not too often from Vogue. Who was the photographer? 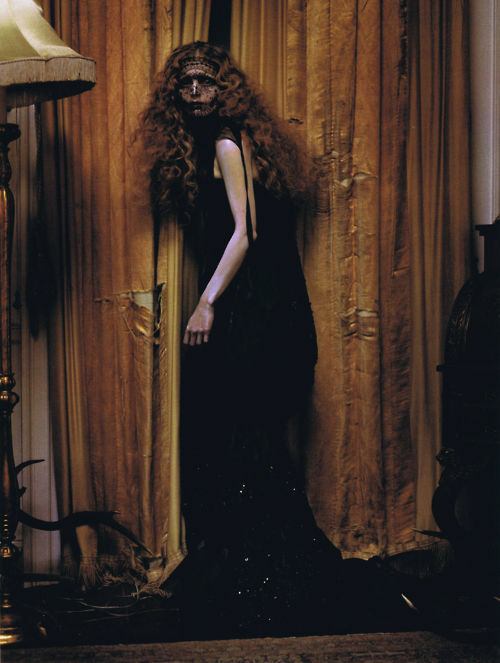 you're right.. Tim Walker is the photographer. I think this is perfect for Halloween, and definitely not too scary. I think people come to expect something that's out of the box from fashion magazines, so I think it works really well. you are right, these pictures are perfect for Halloween, I should get some inspiration from this shoot for my costume..